One of the simplest forms of decorative painting involves the use of paint stencils. Despite the ease of use, certain techniques will give better results. The best tips for using paint stencils include taping the stencils in place, using a stencil brush and use of proper painting techniques, such as applying paint from the outside edges in toward the middle. Larger stenciling projects, such as interior walls, also require careful removing and repositioning of stencils. Paint stencils should be taped in place to ensure that they do not move during use. Special painter's tape is best for this purpose because it is not as sticky as regular tape and will not pull paint from the surface when the stencil is removed. One piece of tape at the top of the stencil and another at the bottom is typically sufficient, or all four corners can be taped down. The tape should be applied in such a way that it does not block any of the stencil's cutouts, because this will affect the design. Stencil brushes are designed specifically for use with stencils. The brushes are made with short, stiff bristles that are all the same length. When applying paint, a painter should tap the brush on the surface to be painted with short up-and-down strokes or a small circular motion instead of stroking the brush across it as in traditional painting. With either method, the stencil brush should always be used dry, and excess paint should be blotted off onto dry paper towels. These techniques help prevent paint from seeping under the edge of the cutouts. Proper use of stencil paint will also help to keep the color inside the cutouts and ensure crisp, clean lines in the finished project. 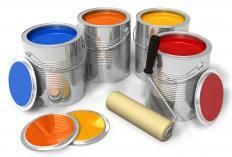 Multiple thin coats of paint dry faster than one thick coat and give the painter greater control over the final colors. Applying color from the outer edges of the cutouts inward will allow the painter to blot away excess color without pushing it underneath the paint stencils and blurring the pattern. Paint stencils are typically not very big. To stencil a living room, kitchen, or bedroom wall, a painter must complete one section at a time. After a stenciled section is completely dry, the painter can then carefully remove and reposition the stencil. Proper alignment with the previously stenciled section is vital to a perfect finished project. Many paint stencils have markings printed on them to help with this alignment. What Are the Different Types of Portable Paint Booths? How do I Choose the Best Living Room Wall Decor? I like to decorate pumpkins with my kids in the fall but I don't want them using the knives. We have compromised by doing pumpkin paint stencils. I got a kit from my local hobby store and it is really easy. It has lots of pre-made stencils that have spooky scenes on them. You just lay one of the stencils against the pumpkin and then paint over it with whatever colors you would like. My kids end up getting covered in pain most of the time but better paint than cuts right? Paint stencils are great because they are an easy way for even an amateur artist to create life like looking figures. Here is a a really easy way to make a stencil. Take a photo you like, something simple like a face or something with one or two objects. Don't use a photo with lots of figures or details like a civil war battle scene. Put the photo into a basic photo editor and then set the bright dark contrast as high as you can. Now just cut out the dark parts with an exacto knife and you have your stencil. When you go over it with paint the paint will substitute for the dark areas you cut out and you will have an exact recreation of the image you chose. Trust me it's easy. Get busy! One of the most important things to consider when making a stencil is what you are making the stencil out of. You want to make sure that you are using a material that will hold up to multiple uses. Some flimsier kinds of paper get paint on them and then disintegrate or become very hard to work with. My two favorite materials are either a thick card stock or Mylar. The card stock is easier to work with but it will eventually fall apart. The Mylar is harder to work with but it will last forever and the material is such that you can cut really detailed stencils into it.